Dr. Parsa Mohebi, founder of Parsa Mohebi Hair Restoration, brought his knowledge and experience with FUE hair transplant to a hands-on workshop in St. Louis. 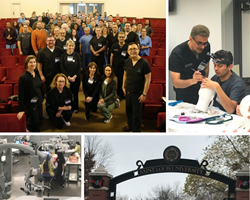 Dr. Parsa Mohebi, the Los Angeles based founder of Parsa Mohebi Hair Restoration, recently had the opportunity to give a lecture and demonstration at the Hair Transplant 360 Cadaver Workshop & FUE Hands-On Workshop in St. Louis, Missouri. The workshop gave Dr. Mohebi the opportunity to share his experience with the basics of hair restoration surgery as well as share the importance of the artistic nature of hairline design and donor management. The workshop was hosted and sponsored by the St. Louis University School of Medicine, Practical Anatomy & Surgical Education in collaboration with the International Society of Hair Restoration Surgery (ISHRS). Dr. Mohebi performed a live demonstration of how to design a hairline on a volunteer at the event. Dr. Mohebi says, “The techniques involved in creating a natural looking hairline involve both medical skill and an artistic flair. There is more to a hair transplant than simply moving hair from the donor area to the balding part of the scalp. A skilled surgeon designs a hairline with the intent of creating natural looking results that give the patient the desired final appearance." When asked about sharing his experience performing hair transplants, Dr. Mohebi said, “Educating newcomers is one of the most rewarding and satisfying parts of my job. I was fortunate enough to be mentored early in my career and I enjoy the chance to give back to those just starting their careers as doctors."